Jacob deGrom just didn’t have it. It was bound to happen, but it was still startling to see. Anyone who even suggests deGrom’s struggles were related to Travis d’Arnaud behind the plate simply doesn’t know anything about baseball. It wasn’t d’Arnaud who caused the chilly weather, nor was it the weather which caused deGrom to miss his pitches by a foot. Baseball is funny sometimes. After thorough research shows Citi Field suppresses exit velocities, the ball was flying out of Citi Field. Of course, when you have power hitters like Pete Alonso and Michael Conforto that will happen anyway. In one series, Mitch Garver went from a nameless guy to the second coming of Mike Piazza. Jason Vargas was terrible, and it is simply inexcusable he was not so much as challenged for the fifth starter spot. The Mets have gotten away with calling up Alonso saying every game matters while carrying Vargas as the fifth starter and having Tim Peterson in the bullpen. Why do fans just let the Mets get away with pushing narratives like this? The booing of Brandon Nimmo and d’Arnaud was embarrassing. Mets fans should be better than that. And just like that, in his last three games, Nimmo is 4-for-10, with two doubles, a homer, three RBI, a walk, and a HBP. What the Mets did to Corey Oswalt is inexcusable. He effectively lost a year getting jerked around by the team, and the first chance this new regime gets, they call him up on three days rest to sit in the bullpen. Oswalt should be making Vargas’ start this Saturday, and if he doesn’t the Mets cannot pitch Oswalt until then because they may need him to piggyback that start. These two games were miserable creating difficult pitching situations. It led to deGrom’s struggles, and it likely led to Jeurys Familia‘s, but that’s now two bad outings from him. Too soon to overreact, but not too soon to take notice. After J.D. Davis‘ two home run game, he’s back to being Davis. He his 42.9% of his balls on the ground, and he has hit 45.8% on the ground this year. His inability to make a play at third led to Familia getting in trouble, and he almost botched a double play only to be saved by Luis Guillorme making an amazing turn. With Todd Frazier getting a rehab start at SS, it would seem Guillorme will be the odd man out, which is a shame because he’s doing everything he could do to stay. It’s at the point where he’s having to wear batting gloves because he has blisters from all his extra batting practice. He’s also been really good in the field. When you have players fighting this hard to stay in the majors, you will get the best results not just from them, but also from the players they are pushing. We are seeing some of that with this team. Robinson Cano has a knack for the moment with two big home runs already and a walk yesterday. That said, his overall body of work has not been good. He may be a slow starter, but he has never been this slow. It’s something worth monitoring with his age, PED suspension, and the Mets history on this front (Roberto Alomar). Mets are going to regret waking up the Nationals. They went from a team in trouble to a team who took consecutive road series from the red hot Mets and Phillies. There may be some holes and warning signs with Alonso here and there, including his having difficulty on two grounders this series, but pointing them out would be being a killjoy. So far, Alonso has been great, and the only things people should point out is how great he has been. We should not care what his final stat line said. Noah Syndergaard was dominant yesterday, and when you consider how everyone else pitched, he looked all the more so. Really, if not for some poor defense, he gets through the eighth unscathed. Good for Jay Bruce hitting seven homers so far this season and helping the Mariners to a 12-2 start. He gave the Mets everything he had, and it was not his fault it was a poor fit. In waht was promised to be a tight NL East, we have the Mets, Braves, and Phillies tied atop the division with a 7-4 record with the Nationals right behind them at 6-5. If you reset yourself back to 2007, your impression of Curt Schilling was that he was a big game pitcher. Your first real memory of him was him striking out the first five batters he faced in the 1993 NLCS en route to the Phillies going to the World Series and Schilling winning the MVP. In 2001, Schilling combined with Randy Johnson to beat the Yankees in seven games to win the World Series. He and Johnson would shared the World Series MVP. In 2004, Schilling would be best remembered for the bloody sock that permitted him to win an important Game 6 that would help the Red Sox become the first team to overcome an 0-3 deficit in a postseason series. He was not only a big game pitcher, he was also a great pitcher. Over his 20 year career, he was 216-146 with a 3.46 ERA and a 1.137 WHIP. In the postseason, Schilling was 11-2 with a 2.23 ERA and a 0.968 WHIP. He has three World Series rings to go with the aforementioned MVP awards. This is an exceedingly strong Hall of Fame case. Schilling has an even stronger case when you go deeper into the numbers. The average Hall of Famer starting pitcher has a 73.9 career, WAR, 50.3 WAR7, and a 62.1 JAWS score. For his career, Schilling has a 79.9 career WAR, 49.0 WAR7, and a 64.5 JAWS score. Based upon those numbers it appeared as if Schilling may eventually be inducted into the Hall of Fame. The voting history certainly looked that way. In 2013, Schilling’s first year on the ballot, he garnered 38.8% of the vote. Schilling has seen an uptick each subsequent year with him getting 52.3% of the vote last year. Certainly, with the remaining years on the ballot, it would seem as if he was eventually going to be elected. That may no longer be the case. Since his retirement, Schilling has been a lightning rod. His 38 Studios went bankrupt, and Schilling faced a lawsuit from the State of Rhode Island. He became an outspoken, if not controversial, voice during in his retirement. His tweets have led to multiple suspensions and eventual firing from ESPN. With Schilling no longer being employed by ESPN, he has not had any need to choose his words more carefully (if he ever felt the need). His latest transgression was promoting the idea of lynching journalists. Schilling did later state it was sarcasm, but the damage was already done. Prominent journalists like Jon Heyman and Mike Vaccaro noted that they may not vote for Schilling for the Hall of Fame again this year. They are hardly alone. While Schilling should likely clear the 5% threshold and remain on the ballot, it is clear the momentum towards him being elected to the Hall of Fame has come to a screeching halt. If that is indeed the case, it won’t be the first time Schilling believes his personal beliefs and politics have hurt his Hall of Fame chance. Assume for a minute that Schilling is right, should his personal politics and “sarcasm” prevent his election into the Hall of Fame? Those who say yes will undoubtedly invoke the character clause, and there is good reason for that. The character clause has been used to prevent gamblers like Shoeless Joe Jackson and Pete Rose from induction into the Hall of Fame. It is currently being used to prevent steroids players like Barry Bonds and Roger Clemens out of the Hall of Fame. Seeing how it was applied, it could then be extended for people of poor moral fiber like Schilling is believed to be. Except it hasn’t quite worked that way. Cap Anson was the genesis of the ridiculously named “Gentleman’s Agreement” that kept black players out of baseball until Jackie Robinson broke the color barrier. Rogers Hornsby was alleged to be a member of the KKK. Roberto Alomar and Kirby Puckett had been involved in domestic violence disputes. Mickey Mantle was a drunk who played games hungover. Paul Molitor used cocaine. Each of these players took part in these activities while playing, and each one of them was inducted into the Hall of Fame. This doesn’t even take half of the things Babe Ruth was thought to have done during his career. The character clause wasn’t invoked as the character clause has been taken to mean cheating the game. So no, the character clause should not prevent Schilling’s induction. Even with that said, it is going to be a factor because writers are human. More importantly, with players like Bonds and Clemens not getting elected into the Hall of Fame, there is a backlog of candidates forcing writers to leave worthy player(s) off of their ballot. If you find yourself in that situation, why not Schilling? You know he’s not going to garner enough support this year, so why let that stop another worthy candidate, like Tim Raines, from getting elected? It is a fair and reasonable position. Ultimately, I hope it doesn’t come to that. In my opinion, Schilling was a Hall of Famer, and I think the Hall of Fame electorate was progressing in that direction. While people are critical of the writers, they did elect players like Eddie Murray and Jim Rice who were famously cantankerous with the media (but not to the level of Schilling’s tweet). With that in mind, if Schilling is not elected to the Hall of Fame this year or the next or ever, he will have no one to blame but himself. By his own words, Schilling believed his actions and beliefs hurt his chances of getting elected in the past. When he sent that last Tweet, he should have known it would again have a profound impact. There will be many who point fingers at different writers for not voting for Schilling, but that blame will be misplaced. It was Schilling who knew the potential consequences of his actions, and he did it anyway. Ultimately, Schilling is his own worst enemy when it comes to his not being elected in the Hall of Fame. I still remember the day the Mets made a surprise deal to get Roberto Alomar. It was an early Christmas gift. It seemed like after a down year the Mets were going to be World Series contenders again. He was coming off a .336/.415/.541 Gold Glove year at the age of 33. He had a 7.3 WAR, and to that point in his career, he had accumulated a 67.0 career WAR. By any measure, Alomar was a superstar and a future Hall of Fame player. He was also a complete and utter disaster with the Mets. In his two years with the Mets he hit .265/.333/.370. His WAR was -0.4. The only good thing is the players the Mets gave up never came back to haunt them. To date, Ben Zobrist has hit .265/.355/.431. He’s accumulated a career WAR of 38.5. Last year, he hit .276/.359/.450 with a 1.9 WAR. He has a UZR of -6.7 at second base last year. He will be 35 next year. With that said, is it still a good idea to give Zobrist a four year deal? 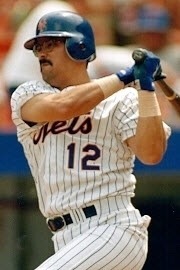 After losing the 2000 World Series and a rough 2001 season, Steve Phillips decided the Mets needed to shift gear. He thought the Mets needed to be an offensive based team. He started with what seemed like the masterful Roberto Alomar trade. He also added Mo Vaughn (don’t trust the narrative, sadly the Mets won this trade) and Jeromy Burnitz via trade. Finally, the Mets signed Roger Cedeno. It was a disaster with the Mets finishing in last place with a 75-86 record. In theory, it made sense. You make a superstar like Alomar feel as comfortable as possible to get the most out of him. In practice, it failed. Alomar would hit .262/.336/.357 in 73 games for the Mets in 2003. With the Mets sitting at 36-47 and 16 games out of first place, the Mets traded Alomar. Sanchez couldn’t save him. In fact, Sanchez needed to save himself. 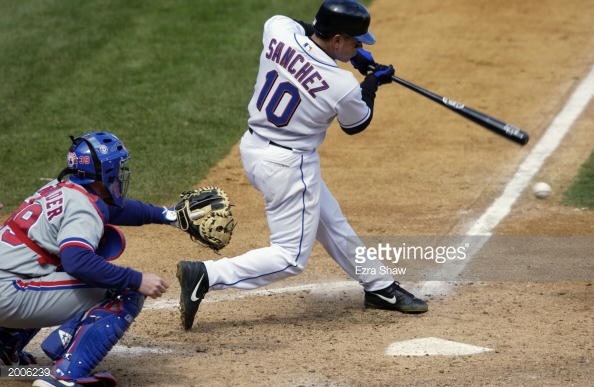 Sanchez had his career worst year in 2003. He hit .207/.240/.236. I think the Mets pitchers this year hit better than that. His play was so poor, he would only play in 56 games. Of course, he would leave the Mets and resurrect his career. Unfortunately, he couldn’t resurrect a Mets team that finished 66-95. So Sanchez reminds us that there was a time that players didn’t always excel like Yoenis Cespedes when they came to the Mets. It’s also a reminder that it takes a special personality like Juan Uribe to come in and create a new clubhouse culture. Again, we learn how different and special this 2015 season is. So with that, we all owe a hat tip to Rey Sanchez.